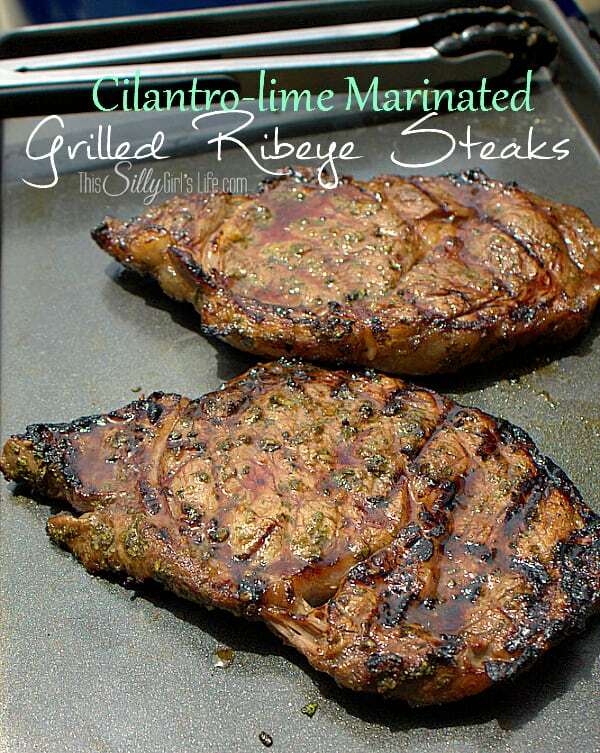 THE BEST Steak Marinade for Grilled Rib Eye Steaks, marinated and grilled to perfection, you will make this recipe again and again! This is seriously the best steak marinade I have ever tried and works on all cuts of steak (and pork!). 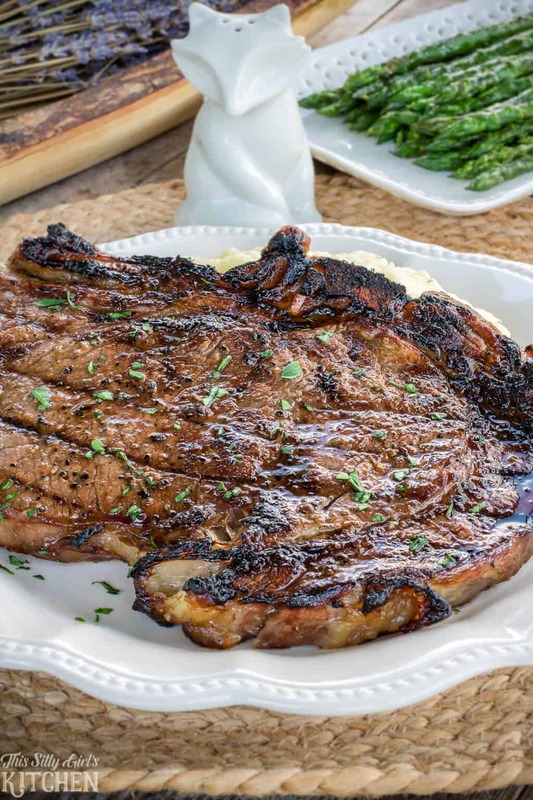 Grilled Ribeye steak is one of our favorite cuts. They are extremely flavorful and being that they are on the fatty side actually helps to keep it moist and tender. This best steak marinade is simple and easy. Even though the ingredients are basic, they take an already amazing cut of meat to the next level! This recipe is perfect for special-occasion meals or when you just want a treat! Rib-eyes were on sale at my grocery store this past week so I picked up a couple and had an epic Saturday meal! This is my go-to steak marinade. I may be known to whip it out for dinners when I want to be extra sweet on Jeremy. 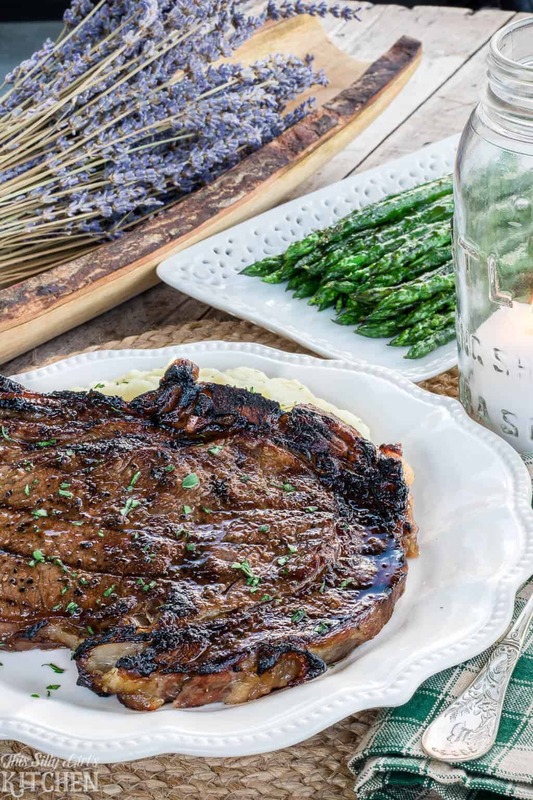 To make it a true steakhouse experience, serve with a romaine wedge salad to start, rustic mashed potatoes, grilled asparagus, and roasted mushrooms! Take me to the recipe for Steak Marinade already! 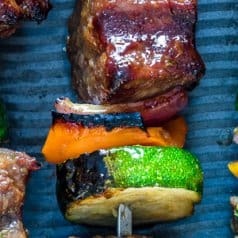 If you would rather not hear my super helpful tips and tricks, FAQ, and my overall awesomeness and get straight to this delicious Steak Marinade – you can very easily scroll all the way to the bottom of this post for the full printable FREE recipe! Bon appetit. For this marinade, the steaks need a good three hours to soak in all that goodness. So make sure to get these babies prepped well ahead of time. Let the steaks come to room temperature before grilling. Let them sit out for 30 minutes before cooking, this will make sure an even cook on the inside. You do not want to throw cold steaks on a hot grill, they just flat-out won’t cook evenly. Plus it will save you a few minutes as well. Make sure the grill is SUPER hot before placing the steaks on. You want to get a nice sear like the photos here, that’s the flavor bomb! You need to let the steaks rest for at least 10 minutes before cutting into them. Don’t worry, add a pad of butter on each steak (oh, yeah! ), cover with foil and let it rest, it won’t get cold! 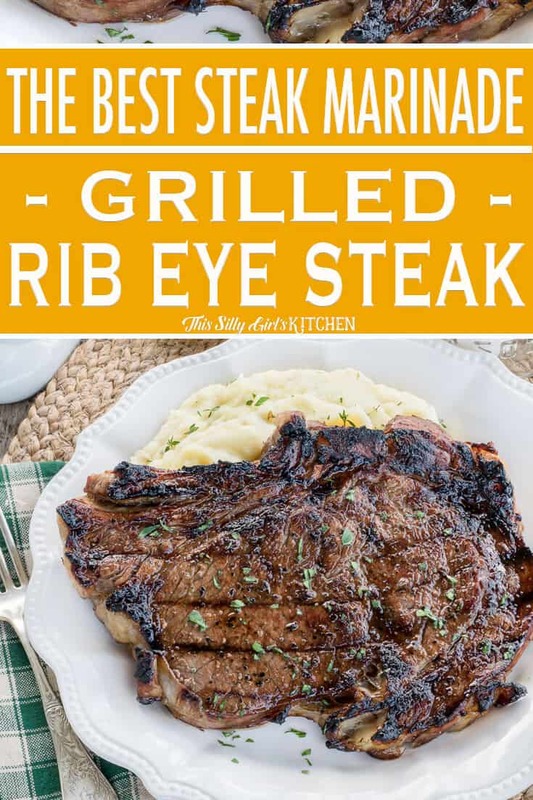 The best ribeye steaks recipe that you must try! What’s the best steak marinade? There are two major components to every marinade that has to be there to be the best. Some form of acid, and some form of sweetness. The acid tenderizes the meat. Acids include citrus juice or vinegar. 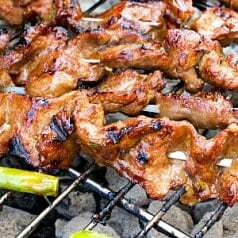 Worcestershire sauce has a high level of acid in it, being our tenderizer for this marinade. The sweetness helps to get that caramelized flavor, or umami, that makes grilled meats extra flavorful. 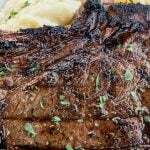 In this recipe for the best steak marinade, I use brown sugar as our sweet component. However, you can also use honey, granulated sugar, or other natural forms of sweeteners in its place. Now that we have our two crucial ingredients, acid and sugar, other ingredients in the best steak marinade include seasonings of black pepper, Montreal steak seasoning, and salt, that’s it! Super basic ingredients you probably already have in your own kitchen. 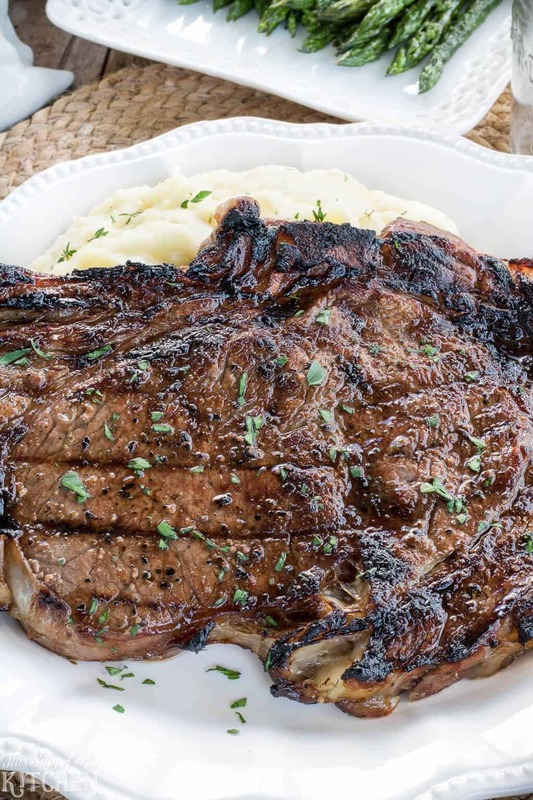 The recipe below is for one 1-pound bone-in rib-eye. It can easily be doubled, tripled, quadrupled, whatever you need! Make sure to add a tablespoon of butter on top of each steak, this will melt into all the crevices and make an instant sauce to pour over everything. But, you can take it up a notch and use a compound butter instead, YUM! 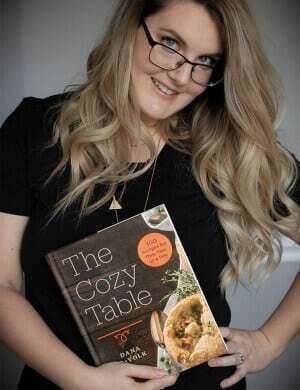 This recipe was featured in my cookbook, The Cozy Table, available now! Place the steak on a large plate, season with pepper, brown sugar, and salt. Using your hands, rub in the seasonings. Drizzle one side with Worcestershire sauce. Flip over and add the remaining Worchestershire. Wrap with plastic wrap, and refrigerate for at least 3 hours, up to overnight. Before grilling, set the steak out for 30 minutes so it can come to room temperature. Prepare your grill, I highly suggest a charcoal grill. But, alternatively, you can use a gas grill or grill pan on the stove. Sear the steak on both sides until cooked to your liking. About 5 minutes on each side. For medium, pull steak off the grill at an internal temperature of 140°F degrees. Remove from heat, add butter, cover with foil and let rest for 10 minutes. Serve with a garnish of parsley, optional. Grilled Ribeye Steaks, marinated and grilled to perfection, you will make this recipe again and again! Place the steak on a large plate or sheet tray. Season both sides with the pepper, sugar, Montreal seasoning, and salt. Rub it in with your hands all over until coated evenly. Sprinkle half of the Worcestershire sauce on one side, flip and add the remaining sauce. Cover with plastic wrap and place in the fridge to marinate for at least 3 hours or overnight. Before grilling, take out of the fridge 30 minutes in advance to come to room temperature. Prepare grill*, cook the steak over high heat for about 5 minutes on each side, make sure to get a very good char on it. Make sure you have a water bottle handy in case you get flare-ups! For medium, pull steak off the grill when the internal temperature reaches 140°F degrees. Place the butter on top of the steak, cover with foil and let rest 10 minutes. Serve with parsley garnish if desired. *I recommend a charcoal grill, but a gas grill or indoor grill pan works as well. 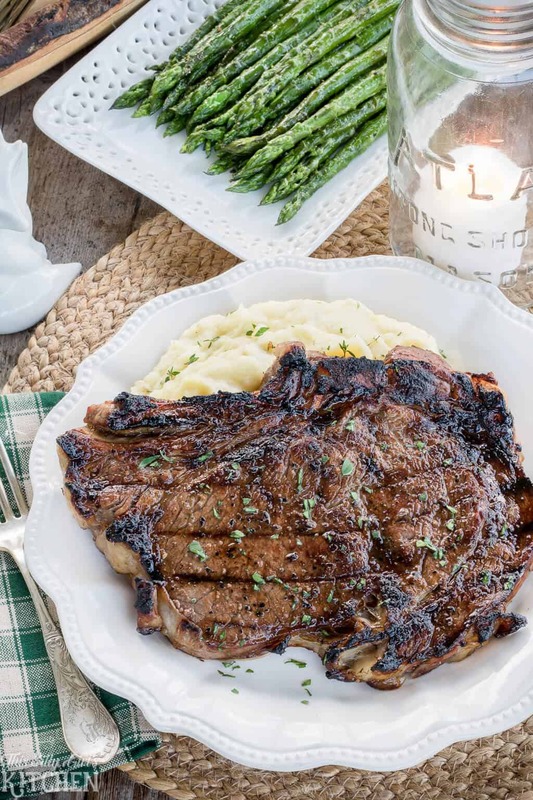 The crust on this rib eye is to die for, luckily we have more Montreal seasoning on hand! Ahh that rib eye is everything I need in life right now! Look at how perfect it looks!! 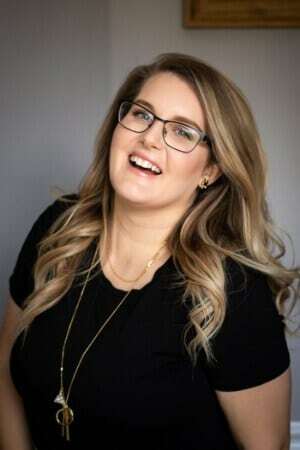 I love the tips you offer in this post, too! You need to try out for The Next Food Network Star or one of their challenges ? Thanks so much! I would love to be on The Next Food Network Star!! OMG!!! Truly the best steak marinade I have ever tasted. I used this on Korean style beef short ribs. Delicious! Will definitely use this on all my choice steaks in the future. Both my husband and I love it! Thank you! I’m so glad!! Thanks so much!